Kellogg's Chocos is the great breakfast friend for both mom and kids. While kids love its yummy chocolaty taste, and have fun with the way Kellogg's Chocos turns milk super-duper chocolaty. Moms can feel relieved that they've given their child a nourishing breakfast to take on an action packed and fun filled day in school. That's because Chocos is now made with Whole Grain, which gives 11 essential vitamins and minerals, and fibre. 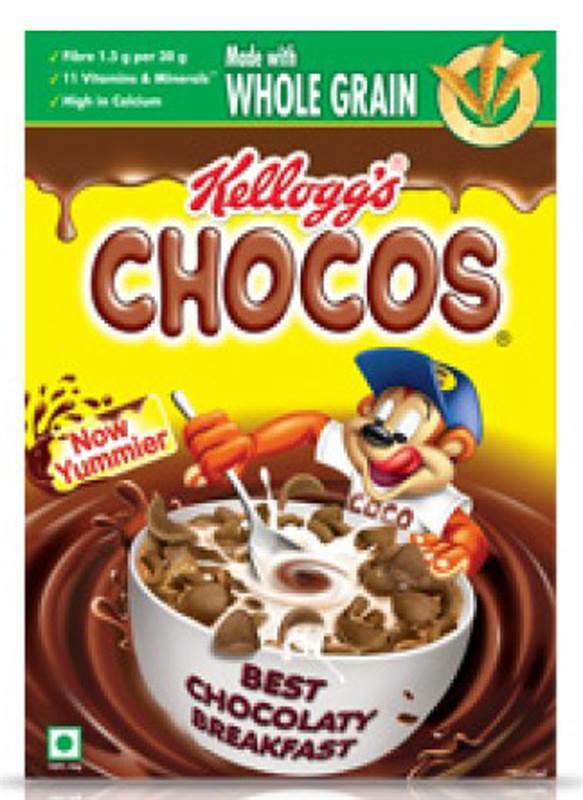 Kellogg's Chocos is a tasty chocolaty breakfast cereal for kids made with Whole Grain. It's fortified with 11 essential vitamins and minerals, has 1.5g of fibre for 30g, is low in fat and also high in calcium making Kellogg's Chocos a good breakfast option for a great start to the school day. Kellogg's Chocos is a fantastic product. Essentially it's low in fat, made with Whole Grain, has no artificial preservatives and is enriched with 11 essential vitamins and minerals. It makes for a good breakfast option with skim milk and fruits. Ingredients: Whole Wheat Flour(29%), Wheat Flour, Sugar, Cocoa Solids(de-flated 5%), Edible Vegetable Oil, Malt Extract, Iodized salt, Colour(INS 150d), Vitamins, Minerals and Antioxidant(INS 320).